*No standing room in the club. Seating only. All seating charts can be found on any non-open mic show pages." There are 52 total General Admission seats in the club, and you are GUARANTEED a seat just not location. General Admission occupies the middle, the side, and the back portion of the room. This includes the comfy bleacher seating that has a bar to set your drink on in the very back of the club. General Admission seats are FIRST COME FIRST SERVE, and CANNOT BE RESERVED - even for large parties. For GA seating, we recommend arriving 30 minutes prior to any show time to ensure you get your pick of seats. Arriving closer to showtime will mean less options of seating. But… our room only holds 80 total so there’s not a bad seat in the house! General Admission seats can only be purchased on the main "event" page. See image below for reference. There are 10 VIP tables total, with 2 seats per table (20 seats total at VIP Tables). All the VIP tables occupy the first 2 rows immediately in front of the stage. Seats are purchased individually, and you DO NOT buy the whole table. 1 ticket = 1 seat. If you want both seats at a VIP Table, purchase 2 seats. If you have an odd number of people in your party and would like VIP seating, select the quantity of tickets you require and just know that one member of your party will be sitting at a table with a kind stranger, or perhaps have the whole table to themselves! There are 2 VIP Booths total, with 4 seats per booth (8 total VIP booth seats). Both VIP booths occupy the left and right sides of the room and are half back in the room - they ARE NOT together. These are our best seats in the house! Seats are purchased individually, and you you DO NOT buy the whole booth. 1 ticket = 1 seat. If you want the whole booth, purchase 4 seats. If you have an odd number of people in your party, but would like VIP Booth seating, that’s totally fine! 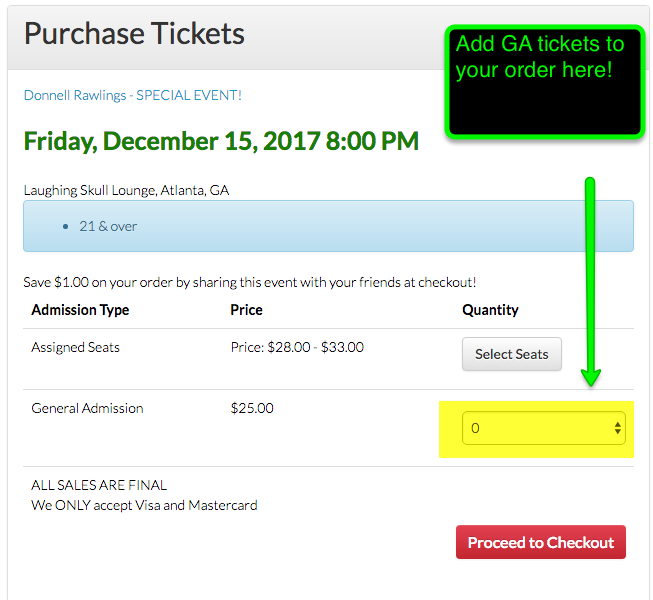 Just select the number of tickets required, and understand that if you purchase 3 out of 4 seats another person does have the ability to buy the extra seat remaining.